Weighty Matters: Is McDonald's new Nickelodeon kids campaign kosher? Is McDonald's new Nickelodeon kids campaign kosher? McDonald's new advertising campaign kicks off today on Nickelodeon and the Cartoon Network. 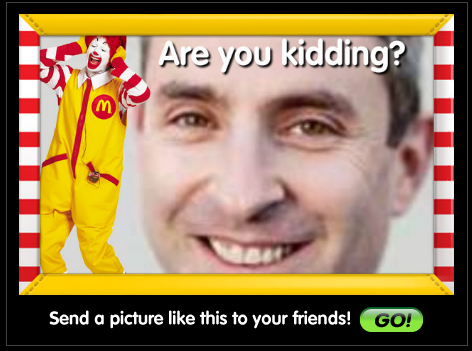 The ads, which feature Ronald in all his glory, have him inviting children to go online to Happymeal.com and upload pictures of themselves. Once uploaded the pictures are then paired with Ronald, just like mine up top. You can pick all sorts of different Ronalds and frames. 1. Communicate to children balanced food choices that fit within a child's nutritional needs. 2. Use our licensed characters and properties to encourage activity and balanced food choices for children to make food, such as fruit and vegetables, fun to eat. 3. Promote to children positive messages that support their well-being, body, mind and spirit. 4. Provide nutrition information for our food to help parents and families make informed food choices. 1. Communicate healthy food choices? - Nope. Only food choice shown was deep fried chicken slurry (nuggets). 2. Use licensed characters to encourage activity or healthy food choices? - Nope. Used licensed character to send kids online. 3. Promote to children positive messages that support their well being? - Only if you think eating take-out on your door step, and sending videos to your friends of Ronald McDonald, support your children's well being. None of this is even remotely surprising of course. The food industry's job is to sell food. Branding matters. Steering cognitively defenseless children online to a website designed to leave them associating fun and happiness with McDonald's is good for business. McDonald's does it, and so does pretty much everyone else. Why wouldn't they? That said, what amazes me is that while it's entirely effortless to find examples of large multinational food corporations bending, twisting and spinning everything in their power to lure children through their proverbial arches, it's equally effortless to find well intentioned health professionals saying that collaboration with these folks is a wonderful idea.